Throughout the Bible horses have an important role. They are described in many ways such as being ridden, pulling chariots, trampling, or going to battle. One unique description found in Revelation is that of a white horse. Purely white horses are fairly rare. In the key text from Revelation we see Jesus described as sitting on a brilliant white horse at the Second Coming. He is described as making judgement and war. This is a glorious yet terrible seen to witness. But what does this symbolism mean? We must start by considering the first audience this book was written to. Revelation was written by John a disciple of Jesus around 90 A.D. It was written to Christians who lived in the Roman Empire. These Christians were familiar with warriors riding horses. The regular Roman solider did not ride horses however, this privilege was mainly for military officers and generals. Rome employed several types of horses for its military. One of the most prized breeds was the Arabian. This stout breed originated in the Middle East and was prized by many civilizations as far back as the time of Abraham. The Arabian is small for a horse averaging around 14 to 15 hands (57 to 61 inches or 145 to 155 cm) tall. It is well adapted to the harsh desert environment. Arabians have dense bones and are able to carry heavy loads over long distances, perfect for military purposes. They also have a natural magnificence to their appearance and grace to their movement that makes them well suited for military use. But the most renowned trait that Arabians poses is their “hot-blooded” nature. A hot-blooded horse is one that is very intelligent, bold and high spirited. These traits are perfect for a war horse. An intelligent horse is one that can create a close bond with its rider.1 Through training they can learn to read each other and operate as a single unit. A large intellect also enables the horse to move in battle more independently allowing the rider to focus on using his weapons. Boldness is necessary in any war horse. A high spirited horse is energetic and always eager to go, a trait also necessary in a war horse. 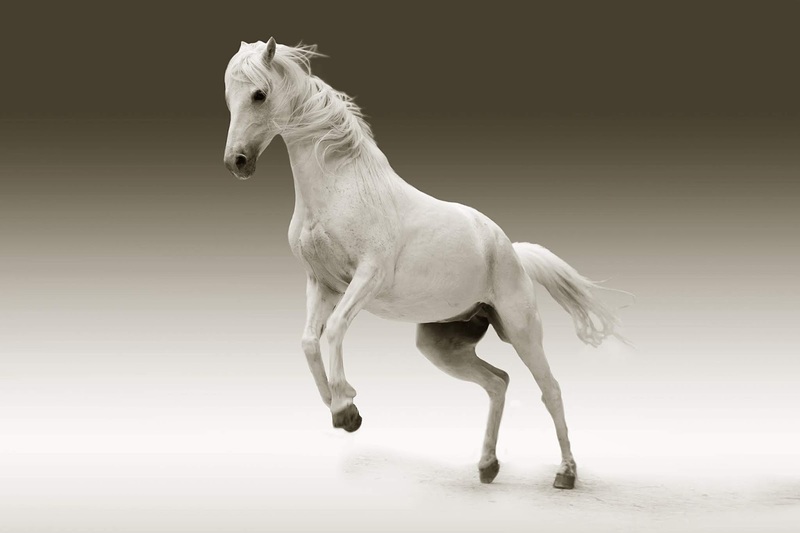 Lastly, some Arabian horses are born with a gleaming coat of white hair. These were often reserved for the highest military officers and seen as a symbol of power and authority. As the early Christians read Revelation they could have easily pictured Jesus mounted atop a proud, white Arabian war horse. As the leader of heavens armies he would fittingly ride the most elegant white horse. This is appropriate to his station as King and to his purity as a holy God. When Jesus came the first time he came to bring peace between God and man and he road a lowly donkey into Jerusalem as a symbol of his humility. When he comes the second time he will come as a conqueror and will bring judgement on everyone. This image ought to cause feelings of fear and relief for all of Jesus’s followers. It should make us fear the judgement of a pure and holy God. This fear is not terror but reverence for a God who is coming to judge our eternal destiny. This fear is a stern reminder that we need to be ready to meet this Warrior on a white horse any day! But this image is also one of relief for those who are ready to meet Him because he is finally coming to put an end to suffering and death. He is coming to set right all the wrongs we have ever suffered. He is coming to conquer our enemy and rescue us. He is our knight in shining armor riding a majestic white steed! Have you ever seen a white horse in person before? Which color horse is your favorite? What if you only feel fear and not relief about Jesus coming to judge the world? Why does the key text say his name is Faithful and True? 1. Shawn T. Norris. “War Horses of the Roman Empire.” (September 21, 2015). Rome Across Europe. Accessed November 30, 2018 from http://www.romeacrosseurope.com/?p=2750.